The All-American Prospects Game, featuring 40 American-born players from all developmental backgrounds, is just a month away. As one of the big events to kick off the 2012-13 season, it is highly anticipated. 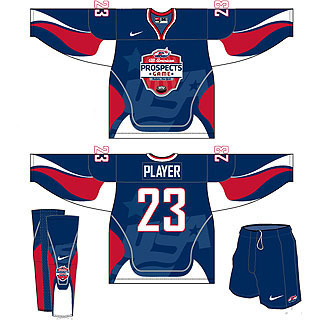 USA Hockey took another step in building the hype by unveiling the jerseys the players will wear Sept. 29 in Buffalo, N.Y. The jerseys certainly have an interesting look. The faded USA logo in the back could be a nice touch depending on how it looks on the actual jersey. If it’s anything like the faded American flag on the back of the USA Basketball jerseys from the Olympics, I’m all for it. The subtlety was jersey gold. The number scheme is very similar to that on the current national team jerseys for USA Hockey, which is pretty slick. Traditional horizontal stripes are always the way to go on jerseys, in my opinion, but this color scheme is a little different than anything I’ve seen. It could look different on the finished product, but I’m always willing to get a good look at something unique. The crest on the jersey is obviously the event logo, which isn’t necessarily the best for a jersey front, but it’s a top prospects game. Gotta go for the branding, right? The socks are pretty unique, too, with the event logo on the knee cap and the interesting wave pattern continuing onto the socks, along with another faded USA logo. The color scheme is a little reminiscent of the Nike swift socks, worn in the 2006 Olympics, which I think were pretty brutal as far as hockey socks go. That said, I think the execution on these is a little better. There’s a lot going on on the socks, but that could be an interesting look. 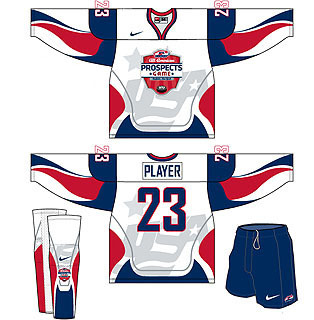 A few of the intial comments I got on Twitter was that they look too much like roller hockey jerseys, which I can see. Though, I would argue they’re not as bad as USA Hockey’s inline jerseys of the past, even if the photo to the right is a guilty pleasure of mine. Statue of Liberty? Yes, please. One commenter said they look more like a Team Slovakia national team jersey, and it does appear to have some similar elements. Despite some flaws, I kind of like them. I don’t think I’d be pumped if the U.S. national teams went to a similar pattern (please, oh please say this isn’t a test run for that), but for a one-off prospects game, they’re pretty alright. This entry was posted in American Prospects, Junior Hockey, NCAA, NHL Draft, USA Hockey. Bookmark the permalink.